This Country Living nursery inspired both my crib choices and my paint color choices for the nursery. I love everything about this space and think the overall style is perfect for mixing in vintage and antique pieces as well. I will probably add just a few more modern touches than this nursery has, but overall I love this space! This nursery is probably a bit too feminine for a little boy, but I loved the black crib up against that dusty, gray-blue paint. The overall color-scheme and simplicity of this space, as well as the fun molding on the crib wall are what I love most about this room. I'd also love to add a few fun and more whimsical touches like in the space below! 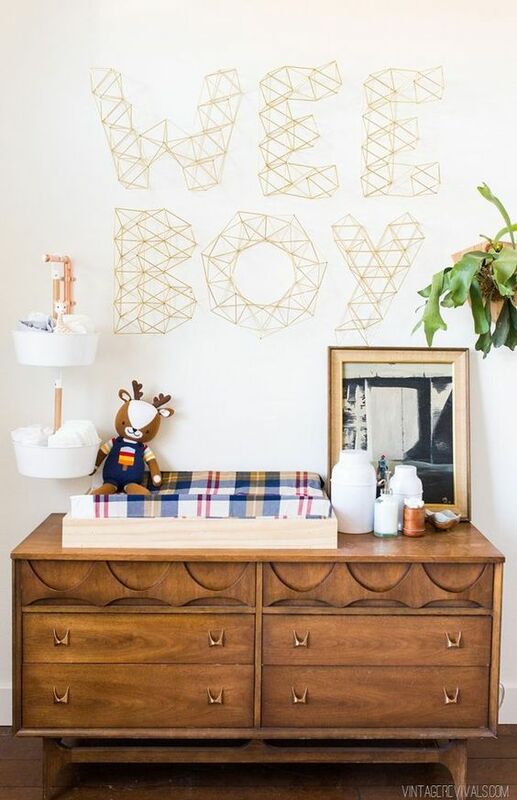 I love the pop of plaid and rich wood mid-century dresser used as a changing table in here. Not a nursery space, but I still love the overall classic and vintagey style of this decor. I also love this space as far as the mix of accessories and pops of color and I'm still considering a fun wallpaper like this on one wall or maybe inside the closets of the room! As far as paint colors, I really like the combo they used in my first inspiration photo with the lighter blue walls and bolder blue trim. I think I have decided to go with Sherwin Williams "Dockside Blue" for the walls and "Bunglehouse Blue" for the trim (see samples below). Since the room we are using for the nursery (see before photos here) has always had all white walls, I'm excited to see how a different color transforms the space. I am going to leave the floors and ceiling both painted white for now. I think I will also paint the outside of the barn door closets the darker trim color too. 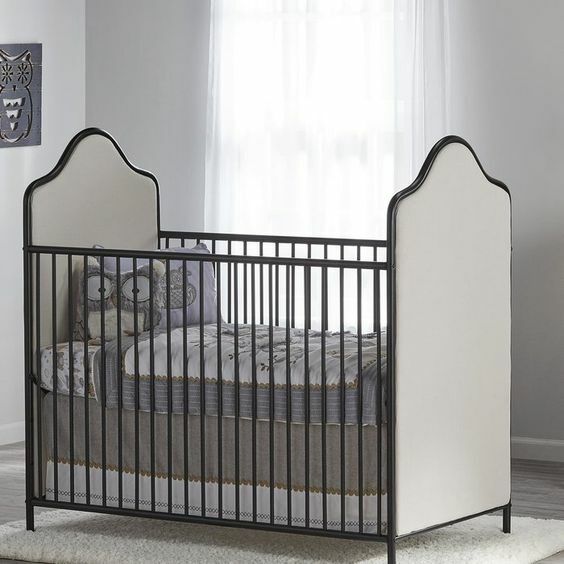 I'm pretty sure the first crib is the winner (it also comes in a gray color shown below that I like as well), but I really love the stark black against the gray-blue wall colors. That's pretty much all I have narrowed down for now, but I'm excited to get rolling with this space and see everything come together! Keep following along to see how this blank, empty room is transformed over the next few months!